In this video we will discuss the performance implications of a multithreaded program when run on a single core/processor machine versus multi core/processor machine. First let's discuss, how to find out how many processors you have on your machine? 1. Right click on the Task bar and select "Start Task Manager" option from the context menu. Click on the the performance tab. 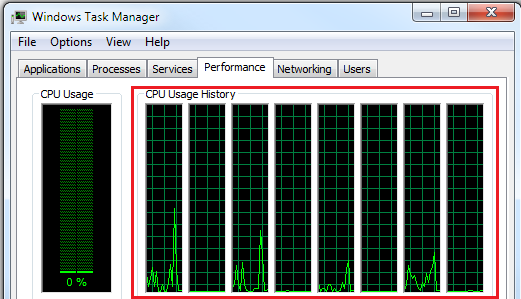 The number of green boxes under "CPU Usage History" should correspond to the number of processors on the machine. On a machine that has multiple processors, multiple threads can execute application code in parallel on different cores. For example, if there are two threads and two cores, then each thread would run on an individual core.This means, performance is better. If two threads take 10 milli-seconds each to complete, then on a machine with 2 processors, the total time taken is 10 milli-seconds. On a machine that has a single processor, multiple threads execute, one after the other or wait until one thread finishes. It is not possible for a single processor system to execute multiple threads in parallel. Since the operating system switches between the threads so fast, it just gives us the illusion that the threads run in parallel. On a single core/processor machine multiple threads can affect performance negatively as there is overhead involved with context-switching. Console.WriteLine("Total milliseconds with multiple threads = "
Console.WriteLine("Total milliseconds without multiple threads = "
Would you please explain if there is any difference between MultiThreading and Parallel Tasking? Can you discuss the volatile keyword ?